Baitfish permits allow the permit holder to catch certain species of baitfish within the Sanctuary Preservation Areas (SPAs) where fishing is otherwise not allowed. A valid baitfish permit allows the following activities to occur within all 18 SPAs. The allowable gear type and size are outlined in the table below by SPA location. Discharging chumming materials or bait for the purpose of catching ballyhoo, balao, halfbeaks, and/or herring. Cast nets which are no greater than 14’ stretched length and/or modified lampara nets which are no greater than 500 sq. feet of mesh area, no greater than 2” stretched mesh, and are not constructed wholly or partially of monofilament or multistrand monofilament material. Cast nets which are no greater than 14’ stretched length, and/or modified lampara nets with no net size restriction, but that do not have greater than 2” stretched mesh, and are not constructed wholly or partially of monofilament or multistrand monofilament material. Cast nets and/or modified lampara nets. All bycatch shall be immediately returned to the water alive. Contact with or disturbance to the seabed is prohibited. Catch of baitfish by hook and line is prohibited. Baitfish permits are issued free of charge and last for one calendar year. Baitfish permits are issued to an individual and may be used on more than one vessel, but may not be used by more than one person. All other sanctuary regulations and applicable fisheries regulations still apply and must be followed. 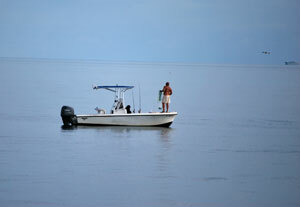 No baitfishing activities are allowed within the Western Sambo Ecological Reserve, Tortugas Ecological Reserve, or the four Special-use Research Only Areas (Eastern Sambo, Looe Key (patch reef), Tennessee Reef, and Conch Reef). All baitfish permit holders are required to maintain a catch log and submit this log within 30 days of the expiration date of the permit. Download the Baitfish Permit Log. To request a baitfish permit, submit your name, mailing address, and telephone number to Joanne Delaney, FKNMS Resource Protection and Permit Coordinator, at joanne.delaney@noaa.gov. Boat name(s) and/or documentation number(s) should also be submitted, when known.